Frank E. Fithen represents one of the earliest documented pioneers of adaptive mobility equipment who redesigned steering wheels to accommodate a disability. Fithen was born in Mingo Junction, Ohio on September 26, 1881, and at an early age he developed a love of locomotives and automobiles. As a boy, while attempting to jump a freight train, Fithen fell severely injuring both of his arms. Friends carried him home on a window shutter and a physician mended Fithen’s wounds on the dining room table because the town lacked a hospital. After surgery, Fithen became a double above-the-elbow amputee with residual limbs extending a couple of inches from his shoulders. Despite his lack of arms, Frank lived life to its fullest and often remarked that the only thing he could not do was scratch his back. Postcards of Frank E. Fithen, showing him and his vehicle he adapted for armless driving. Fithen adapted to life without arms by learning to use his mouth, feet, and assistive devices to perform daily activities in new ways. When dressing, Fithen only required help fastening buttons. He used his feet to write and eat using special implements. Fithen lit cigarettes by holding one along with a match in his mouth, striking the match on a table, and lighting the cigarette with deft motions of his lips. His pastimes included dancing, ice skating, pinball, bicycling, unicycle riding, and driving cars. As a young man, Fithen worked as a trick unicyclist and bicyclist and became renowned as the armless wonder while touring the entire nation with the Barnum and Bailey Circus. Common perceptions of disability view these feats as remarkable, but they are common adaptations that persons with disabilities use to cope with daily living. Fithen's feats of driving were remarkable. At the turn of the century, auto designers and enthusiasts tested their vehicles in road races, endurance tests, and time trials. Fithen like many Americans who fell in love with bicycles, later fell in love with automobiles and the thrill of the open road. Lacking arms, Fithen found conventional driving controls impossible to use so he redesigned his steering wheel and drove across the nation setting speed and distance records. Fithen designed an adaptive steering wheel he could operate with his residual limbs. The first design featured a series of four steel rings just inside the outer wheel. This design was later refined to include six rings. Fithen steered with one limb while the other manipulated the hand throttle or shifted gears. He operated the three pedals with his feet. His adaptive steering wheel was the only modification to his cars. In the 1910s, using his adaptive steering wheel, Fithen not only drove through every state in the contiguous United States at a time when there were mostly dirt roads and no interstate highways or GPS, but he did it at blazing speed. In an era when a mile-a-minute dizzied most people, Fithen boasted a speed record of 58 miles per hour and a distance record of 85,000 miles. By 1917, Fithen had driven over 115,000 miles across the nation demonstrating his driving prowess at fairs and carnivals. Fithen obtained notoriety not only for his steering wheel and feats of driving but also for his prowess as a businessman and promoter. He sold postcards of himself during his travels, and it became a lucrative venture. The cars that he drove and the prevalence of his postcards on today's antique market are evidence of his business prowess. Fithen's favorite car was his Oakland Greyhound speedster, a six-cylinder, 60-horsepower roadster costing three times as much as the most expensive Ford Model T. He attributed his automotive success to the Oakland and promoted the company during his travels. Fithen eventually settled in New Orleans with his wife Ruth. He owned and operated an auto garage until financial hardships during the Great Depression caused its closure. He ran a bar for a short time, but soon after the Depression ended, he opened another garage, which he operated until retirement. On June 14, 1940, Fithen died in New Orleans. 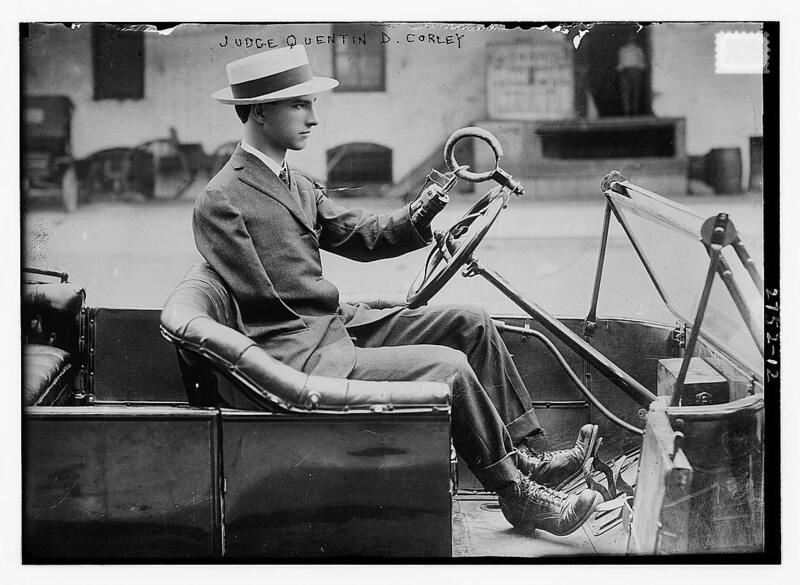 Judge Quentin D. Corley driving his automobile. Judge Quentin D. Corley offers another example of a disabled person turned independent inventor. The loss of his right arm and left hand spurred him to patent several prosthetic limbs. He also tinkered with his automobile, adapting it to accommodate his disability. Corley was born in Mexar, Texas on January 21, 1884. 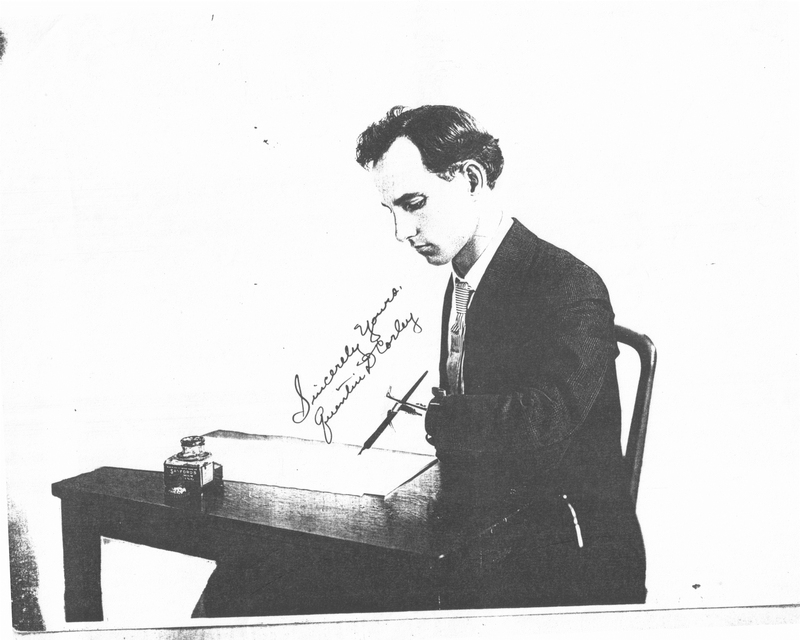 After graduating high school in 1901, he spent four years working as a bookkeeper and stenographer while preparing for a career in civil engineering. Tragedy struck on September 18, 1905 in Utica, New York when Corley fell from a train. The accident caused the loss of his right arm and shoulder along with most of his left forearm. After recovering, Corley stopped pursuing a career in civil engineering and worked at several odd jobs. He eventually devoted himself to the study of law. Within two years, he passed the examination to become a member of the Dallas County bar in 1907. The following year he was elected Justice of the Peace. In 1912, Corley successfully campaigned for the seat of county judge, and he held that position for the rest of his legal career. His peers admired him for overcoming his physical limitations but more so for his lifetime dedication to public service. As an inventor, Corley worked hard to create and promote adaptive technology to aid disabled persons with everyday activities. Similar to many independent inventors in this period, Corley hoped to improve prosthetic limbs and profit from his inventions. 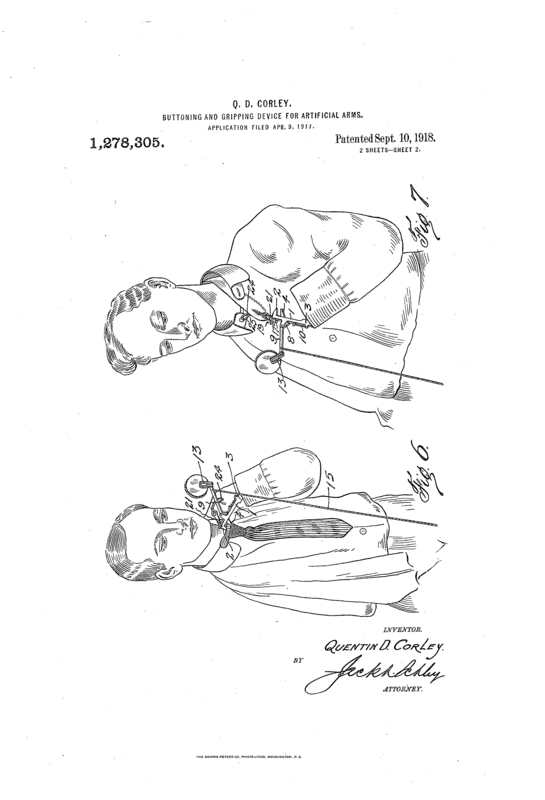 He patented two prosthetic hands, a prosthetic arm elbow joint, and a device to assist people with prosthetic hands when buttoning their shirts and tying neckties. 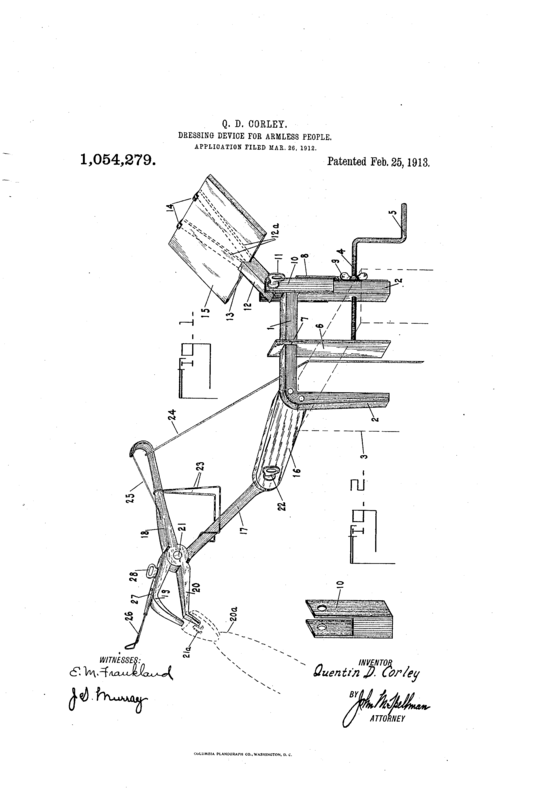 A sample of some of the patent drawings from Quentin D. Corley's patent applications. An avid motorist and tinkerer, Corley developed several modifications for his Ford Model T so he could drive with his one residual limb. His adaptive steering wheel consisted of a steel hoop about four inches in diameter attached to a rotating axis that clamped onto the steering wheel. The device allowed varied positioning of his residual limb. Corley's most notable modification was the spring-loaded accelerator pedal that he used to manipulate his Model T's hand throttle. The pedal connected to the throttle lever, typically operated with the right hand. Depressing the pedal increased the throttle, and a spring-loaded mechanism returned the throttle to the idle position when released. Corley also installed a button in the floorboard to honk the horn with his foot. The Model T’s planetary transmission did not require continuous shifting of gears, and it lacked a clutch pedal. Its ease of use was a major factor in the car’s mainstream success. 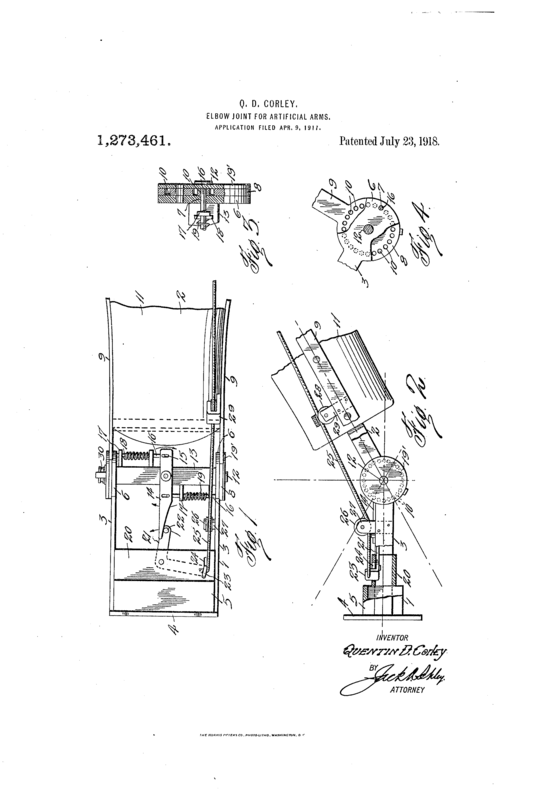 This arrangement offered Corley the advantage of devoting his one limb to steering, and the original three pedals plus his fourth pedal enabled complete operation of the car using his feet. He was capable of starting his Model T with the hand crank using two leather straps for leverage, which made the car much easier to crank start with one arm. Local papers reported Judge Corley motoring around Dallas County running errands, traveling to work, or just taking a leisurely drive. He also drove long distances on auto tours promoting his prosthetics to World War I disabled veterans. In 1980, after a lifetime devoted to advancing public welfare, Judge Quentin Corley died at age 94 in Dallas, Texas. 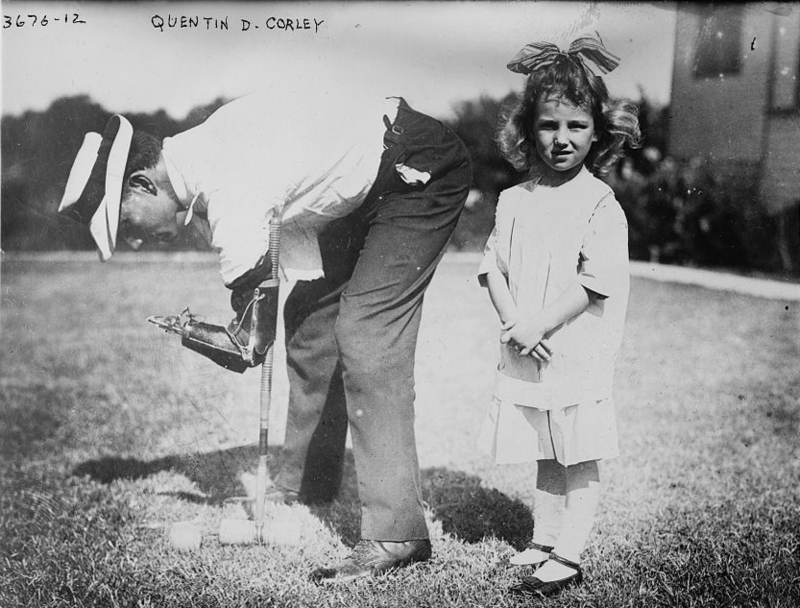 Corley using devices of his invention to play croquet and sign his name. It is difficult to determine the impact that Fithen and Corley had on future adaptive technology and mobility equipment. However, their accomplishments demonstrate that they were on the bleeding edge of adaptive technology. 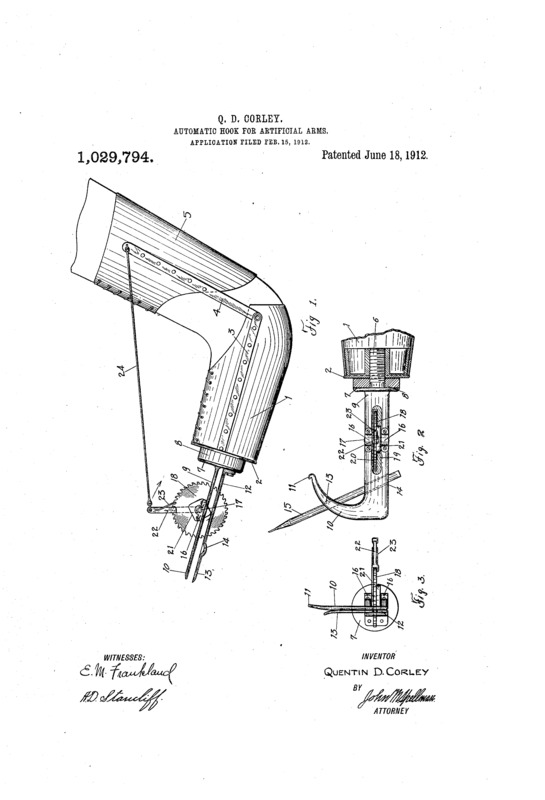 Corley’s prosthetic devices, designed to aid with gripping and manipulating objects, represent incremental steps towards the later development of split hook prosthetic hands, that have been the mainstay since the mid-twentieth century. Current adaptive steering wheels designed to accommodate residual limbs and prosthetics have changed very little in the past century and very much resemble Fithen’s and Corley’s designs. Early automobiles did not have the standard driving control configuration of modern vehicles, and Corley’s gas pedal was ahead of its time. The self-starter or electric starter was one of the earliest and most significant automotive innovations that increased the ease of use and accessibility of automobiles. Early automobiles were started with a hand crank typically located in front of the engine. Starting the engine required a great deal of strength and effort along with a risk of the crank kicking back and injuring the operator. Today drivers take the electric starter for granted or consider it a convenience, but it made automobiles more accessible for all users. 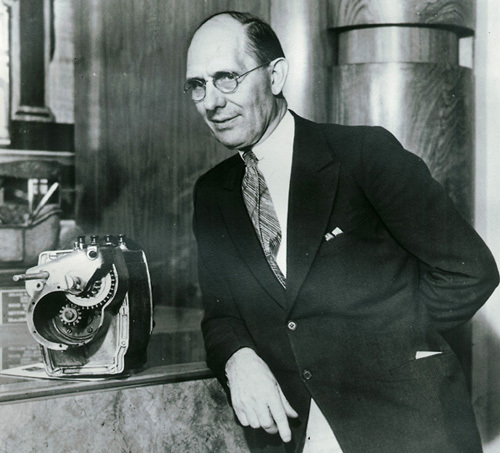 In 1911, Charles F. Kettering invented the electric automobile starter, commonly referred to as the self-starter. It was designed as part of an integrated electrical system for starting, ignition, and lighting . Cadillac general manager Henry Leland encouraged Kettering to fully develop his starter, and in 1912 it became available as an option on Cadillac cars. Kettering designed a battery-operated electric motor small enough to fit under the hood. The motor turned the flywheel, which moved the pistons and started the engine. He also designed the self-starter to recharge the battery so it would have enough charge for the next start. To prevent overcharging the battery, he developed a carbon-block rheostat that disconnected the starter once the battery was fully charged. Kettering’s self-starter was developed to enhance convenience, comfort, and safety, but it also had universal design features that increased the automobile’s accessibility. Women and some disabled drivers benefitted from the speed and range of gasoline-powered automobiles. In the twenty-first century, people who are missing hands and digits or who have impairments that make keys difficult to use can now benefit from a key fob for keyless entry and pushbutton starting.